It’s not hard to live green when you knew that there are products and brands that can help you to live a more greener and sustainable life with the products they offered. Since, i have committed to live a more sustainable and eco-friendly life. I have learned to become more eco-conscious and favor using organic and natural products rather those which contents harsh chemicals and ingredients that greatly affect our environment. After all, living green gives a satisfaction and more healthier life. One box gives you the opportunity to know and learn more about living a greener , sustainable life. Devoted to provide the highest quality of ethical and sustainable products/brands, Conscious Box offers an awareness of products that are authentic and purposeful. Each month is a discovery of best products in the planet. Product options includes certified vegan, 100% gluten free , a variety of unique pure and natural products. For a very affordable price, you can start and try to subscribe for a month box for only $ 19.95 which includes shipping . You have the option to choose among Classic, vegan or gluten free, something that will suit your needs. And when you discover that this works for you, which i am very sure that it will do, you can choose among their 3 months, 6 months or 1 year subscription. Some of the eco-conscious brands include, 7th Heaven Naturals, Ancient Essence, Beanfields, Bumble bar, country choice organics, eco-me,good clean love, yoga earth among others. That is something worth having and I am very anxious to receive my first concious box and i will definitely give you updates and reviews on their products. Here’s the best part. Conscious box is very generous to provide one of my reader a chance to try their box for three months. Yes. That is three months subscription worth $ 59.85 . All you need to do is to check the rafflecopter for the rules. Let us all live a more greener life. Discover the best products on the planet every month. Conscious Box is presenting its very special Earth Day box! Each products help you lighten your footprint and better show love to Mother Earth. 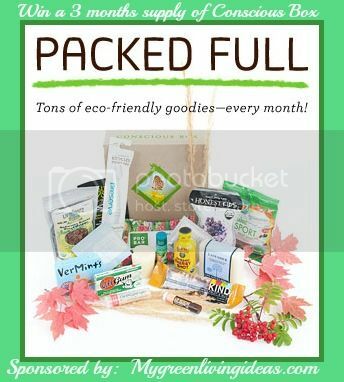 From scrumptious snack alternatives to ultra-conscious home products, the April Earth Box will introduce you exciting new things in the world of green! Sign up for Conscious Box today and find all new ways to support a healthier, happier planet! One lucky winner gets 3 months supply of Conscious Box value at $59.85. Give away ends on April 7, 2013. Open to continental US only , 18+, To enter, please use the rafflecopter below. Disclosure : This site does not receive compensation for this publication. My opinions may differ from those of others. This site is not responsible for prize shipment and in no way connected with Facebook, Twitter, or any other social media. Please contact, melandria with questions or to see your brands or blogs featured on the next event. Signed up under krispc12@hotmail.com – Living green is important not only for our health but for our planet as well. this sounds like a great site! Living green is something we are trying to do in my family. From growing our own foods to recycling more to not making as much waste as we used to. I think this box would be perfect for my family to try. Thank you for the chance to try something new! signed up under jen.whitley@live.com. Living green is important for my family to be as healthy and happy as possible. I also want to be able to share a beautiful, healthy, earth with future generations. I think living green is important because it is healthier for your body AND the environment. It’s partly about taking care of yourself, wanting to live longer and feel better but it is also about preserving the natural resources and the environment for the future. Signed up with nesportzfan@yahoo.com. I think it’s important to live green b/c God made us stewards of the earth and living green is doing just that!!!! going green helps to keep tomorrows around for our children and for their children . I made one comment a few days ago but it isn’t showing up here, not sure what happened… I think living green is important because it is better for our overall health (reducing exposure to chemicals, pesticides, etc) and it is better for the environment (using more renewable resources, reducing waste that goes to the landfill, etc). It is both an investment in our personal future as well as the future of generations to come. Signed up under w.briesch@gmail.com. Living green is important because if we don’t start and teach our children we are going to be in alot of trouble. I would so love to try the Conscious Box. It looks so healthy, but it’s not in the budget. i really like this whole concept!! !